Before you start this make sure your FIM server is setup. Look here for information. 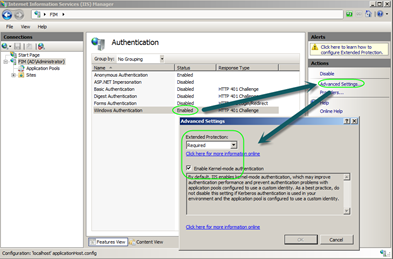 Before you install the Microsoft Forefront Identity Manager (FIM) 2010 server there are some tasks that you must do before hand. To run the FIM Service component, you must have a dedicated domain service account. 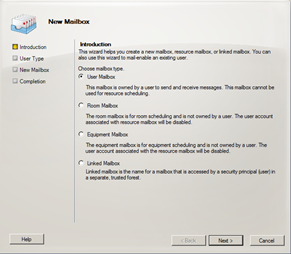 To be able to use the Office Outlook integration feature, an Exchange Server mailbox must also be created for this account. 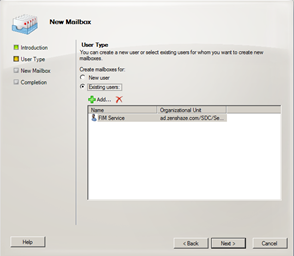 To use the FIM Add-in for Outlook feature, you must set up the domain service e-mail account on a server that hosts Exchange Server 2007 or Exchange Server 2010. 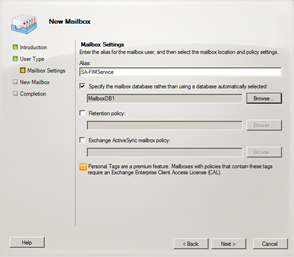 If you plan to use SMTP for notifications rather than Exchange Server, ensure that this service account has the required permissions on the SMTP gateway. This account also is used to send e-mail notifications from FIM 2010. This account should not be granted local administrator permissions. You can make this however you want but this is how I did it. You must create a service account to run the FIM Synchronization Service. This service account must be a domain service account. This account should not be a local administrator account. You must create a domain account that is reserved for the exclusive use of the FIM Service management agent (FIM MA) used by the FIM Synchronization Service to communicate with the FIM Service. 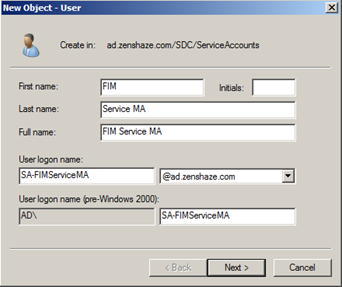 The FIM Service has to know the name of the account that the FIM MA is using so that during setup it can give the account the required permissions. This account should not be a local administrator account. As mentioned previously, there are two service accounts that are used to run the FIM server components. They are called the FIM Service service account(SA-FIMService ) and the FIM Synchronization Service service account (SA-FIMSyncService). The FIM MA (SA-FIMServiceMA)account is not considered a service account, and it should be a regular user account. For the FIM Synchronization Service service account to be able to impersonate the FIM MA account, the FIM MA must be able to log on locally. Click Start, and then click Administrative Tools. Click Local Security Policy, and then click Local Policies\User Rights Assignment. Be aware of GPOs that might overwrite this!!! The service accounts should not be members of the local administrators group. The FIM Synchronization Service service account should not be a member of the security groups that are used to control access to FIM Synchronization Service (groups starting with FIMSync, for example, FIMSyncAdmins). I do not have Exchange Web Services installed on the FIM Server. 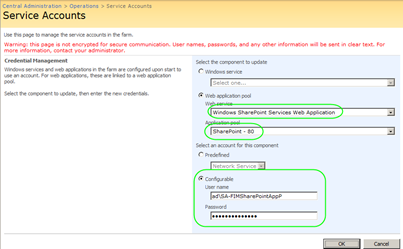 Before you install the FIM Portal and Password Portal, run the SharePoint 3.0 Services Configuration Wizard. This creates a default SharePoint site for you. Verify the installation by navigating to http://localhost:80 on the server where you will install the FIM Portal. 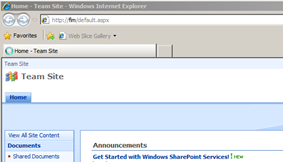 You should see a SharePoint site and not the standard Welcome to IIS7 message. If you see the Welcome to IIS7 message, reconfigure Office SharePoint to display a default SharePoint site at this server address or the address where you installed Office SharePoint. By default, IIS uses the Network Service account for the Application Pool. Change this to a Domain Service Account for SharePoint to use. Later you will enable Kerberos delegation, and only one identity can use one Service Principal Name (SPN). 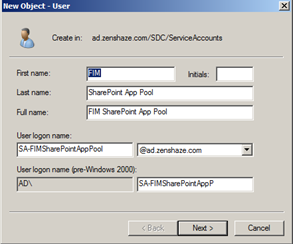 Create an account in the domain for use by the SharePoint Application Pool. Start SharePoint 3.0 Central Administration from Administrative Tools. Select Operations and Service Accounts. 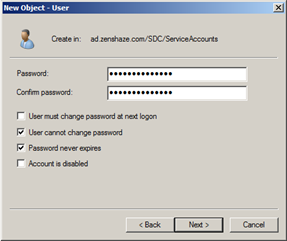 Enter the user name and password for the service account that you created in the first step. Enable the Application Pool to use the service account for Kerberos. Frankly I do not care how you get the certificate into IIS, in my case I use a self generated one as this is a lab. 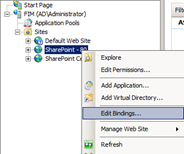 Click Sites, and then select Sharepoint – 80. Click Bindings, and then click Add. For certificate, select the one that has the same name as the server. 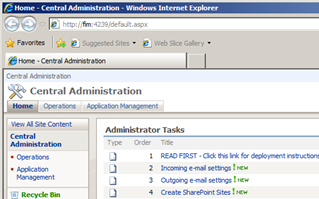 Click Start, click Administrative Tools, and then click Sharepoint 3.0 Central Administration. Click Operations, and then click Alternate Access Mappings. Change http://servername to https://servername, and then click OK.
A lot of this was done when I setup SQL and is not covered here. Before you install the FIM Service, certain tasks should be completed and verified on the server that is running SQL. Ensure that the service accounts used by SQL Server Database and SQL Server Agent are domain accounts, do not use local computer accounts. When the FIM Service and FIM Synchronization Service are installed, the data and log files are created in the default locations that are specified by SQL. For optimal performance, these should be located on different drives and on different spindles. I will be using the default settings on the SQL server so I do not need to change this. SPNs are necessary for the Kerberos v5 protocol to be used for authentication. Enabling Kerberos helps to make the traffic secure, and it is required for the clients to be able to communicate with the FIM Service. SPNs must be registered in the domain for Kerberos to work. The <alias> above is the address that is entered during FIM Service setup and used by the clients and the FIM Portal to contact the Web Service. This can be a CNAME or host (A) resource record in DNS. If you are using Network Load Balancing (NLB), this is the name of the cluster. The <serviceaccount> above is the account that is used by the FIM Service. If you are using several different names—for instance, fully qualified domain names (FQDNs) and NetBIOS names—to contact the server, repeat the steps for every name. I did this on the FIM Server but you can do it on any server. 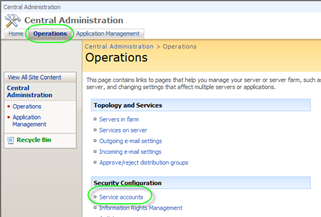 Turn on Kerberos delegation for the FIM Service service account in AD DS.